I am told that we need more leadership around here. I am told that we manage things, but we lead people. My experience tells me otherwise. I believe, especially as companies grow larger, that we need more management. I would concur that it is very difficult to manage people. People resist being managed. But, it’s not the people who need to be managed, it’s the relationships between those people. In a company, it is the working relationships that need to be managed. I hear about personality conflicts in an organization. But, I don’t see a personality conflict, I see an accountability and authority issue. In an organization, we rarely define the accountability and authority in the working relationship. We never defined where people stand with each other, who can make the decision, who can make a task assignment and who is accountable for the output. We take relationships for granted. We take for granted that people know how to behave with parents, with siblings, with teachers. We take for granted that people know how to behave as managers, but, in most cases, managers behave the same way they were treated by their managers. There is a science to all this. It has to do with context. Effective managers are those who create the most effective context for people to work in. It is that unwritten set of rules that governs our behavior in the work that we do together. There is a science to context. 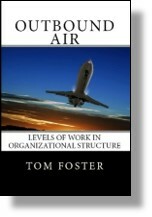 Organizational structure is context. It is the defined accountability and authority in our working relationships. Without it, people fill the void with all kinds of shenanigans. Not their fault. It is the responsibility of the manager (including the CEO) to set the context. This entry was posted in Accountability, Organization Structure and tagged accountability, authority, defined relationships, organizational structure on November 14, 2016 by Tom Foster.